Just discovered this author. Clicked on the Amazon link. Plan to get all three of his books. Check it out for yourself. 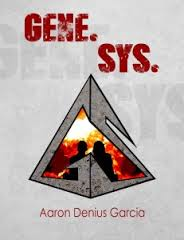 A spectacular YA novel, this Dystopian story will have you waiting anxiously for the next book by Aaron Denius Garcia. Being a fan of religious fiction and biographies (do NOT panic if you are not religious, this story is not either) I was immediately drawn in to read the story about Atom and Ev, and how they were created to create a new life for everyone, in E.D.E.N. Created much like I would assume a test-tube-infant was created (no offense intended here, I am not a Science or Biology student), Atom and Ev live in a secluded, monitored, high-security environment. They are on the ‘inside’; the rest of the human race is on the ‘outside’. A select group of Doctors and Scientists are tasked with creating a new race of humans, whatever the cost. The humans on the outside are barely alive, fighting wars, famine, and plagues. Imanikingblog is right: the ball is in your court, oh reader. What will you do with the gift God gave when He sent His ONLY begotten Son to take the punishment for your sin? Will you choose to take the consequences anyway and spend eternity in hell, or will you accept the Gift, and ask Him to make you over in His image, so you can enjoy real peace, joy, and love, and spend eternity in a happy place with no more pain, suffering, death, sin, or hate? Amidst the many wonderful and out-of-this-world-names that we call HIM or address Him as – trying to understand an Infinite God through our finite minds and limited abilities, I also call Him THE ANSWER. How do you handle your confusion when The Answer asks a question? Is it that, He doesn’t have answers anymore? At what point did He lose that ability? My mind ponders on why The Answer would have questions and dare to ask them…ask me a mortal. What does He expect of me? How do I defend this “inadequacy”?